Leo sets the standard for a high quality text-to-speech voice. His deep and smooth voice perfectly captures the allure of the Canadian French accent. Leo has a beautifully smooth voice with all the allure of a Canadian French accent. His speech is clear and precise with appropriate intonations and has an ideal balance of a friendly and professional tone. NeoSpeech Inc., a leading Text-to-Speech provider, has released a new high quality Canadian French voice, Leo. 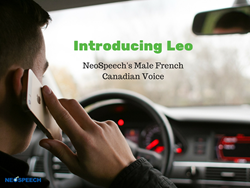 Leo is NeoSpeech’s first male Canadian French voice. He joins Chloe to give consumers a male and female Canadian French option for high quality synthesized speech. Leo has a beautifully smooth voice with all the allure of a Canadian French accent. His speech is clear and precise with appropriate intonations and has an ideal balance of a friendly and professional tone. This combination makes him perfect for IVR, GPS, mobile apps or personal use. Leo can handle any text, long or short, with ease and can turn your text into excellent sounding audio in a matter of seconds. Leo comes with a comprehensive customizable dictionary that enables you to customize the way he says certain words or phrases, allowing you to add industry-specific jargon or slang to your audio. Click HERE to listen to Leo’s voice for yourself. Leo and Chloe are both USS (Unit Selection Synthesis) based voices; a technique which is widely known for producing the highest quality synthesized voices. After a year of hard work, NeoSpeech’s speech engineers are proud to be able to offer some of the highest quality Canadian French voices available on the market. NeoSpeech’s website allows you to type any text into their Text-to-Speech engine and hear the audio output for free for non-commercial use. So, if you would like to hear Leo or Chloe say anything you want, visit http://www.neospeech.com. For commercial use, please contact our friendly sales team at sales@neospeech.com. NeoSpeech Inc. specializes in high quality text-to-speech solutions for a range of embedded, mobile, desktop and server applications. With over 30 voices in 7 different languages, including English (US and UK), Candia French, Mexican Spanish, Korean, Japanese and Chinese, NeoSpeech’s voices are ideal for use in e-learning, transportation systems, mobile apps, entertainment systems and more. To learn more about NeoSpeech’s Text-to-Speech products visit http://www.neospeech.com/products. If you have any questions or comments, please feel free to email NeoSpeech or use their sales inquiry form: http://neospeech.com/sales-inquiry. Keep up to date with TTS technology advancements and applications by following NeoSpeech’s blog at blog.neospeech.com or follow them on Facebook at http://www.facebook.com/NeoSpeechTTS and Twitter at http://www.twitter.com/NeoSpeech.